Heat water in a sauce pan and blanch tomatoes for 8 – 10 minutes. Grind all the ingredients listed under onion peanut paste to smooth paste in a blender or food processor (Adding water if required while blending). Heat oil in a pan and add the ground onion paste. Cook it on medium flame, stirring continuously, till its raw smell disappears and oil starts to leave the sides, about 7-10mins. Now add in the turmeric, chilli powder, cumin powder, coriander powder, garam masala and stir for 2-3mins. Then mix in the tomato puree and cook it for 3-4mins. Add in salt mix until combine well. 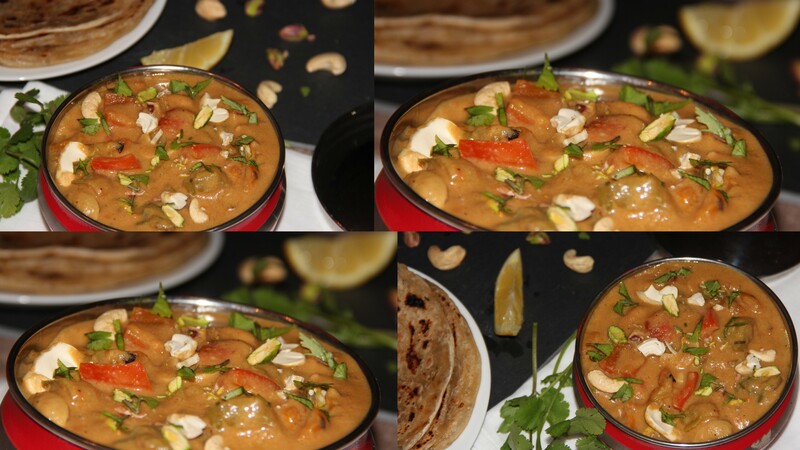 Add roasted cashews, pistachio, capsicum and continue to simmer for another 5-7mins for the flavours to blend well. Switch off the flame and garnish with coriander. 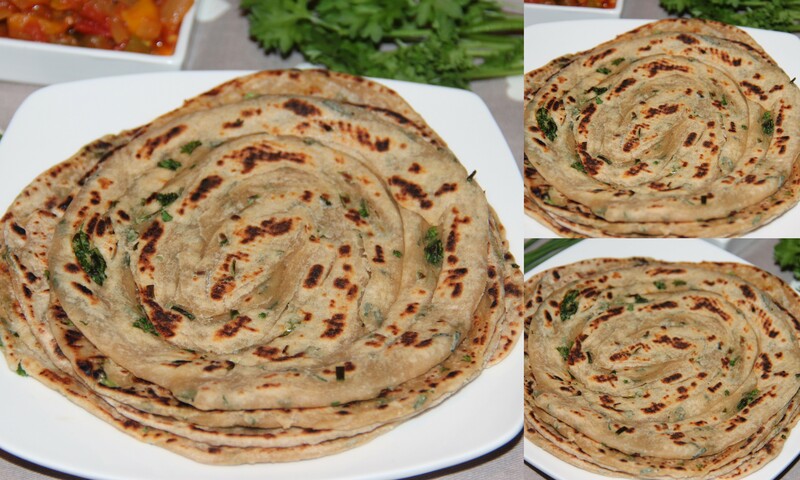 Serve with Lacha herbed parathas (Recipe click here). Have used limited cashews as part of balanced diet. More cashews can be added as per taste. Posted on January 15, 2015, in Indian, Side dish and tagged capsicum, Cashews, Chitras healthy kitchen, drchdietfood, Indian recipe, Indian Side dishes, Vegetarian side dishes. Bookmark the permalink. 24 Comments. I will definitely give it a try, its absolutely creamy and looks so delicious….. This looks lovely and delish! A work of art! Waw! Thie recipe look amazing & just wonderful too! I never have seen anything like this before! Oh my Chitra – a cashew gravy – that is my favorite nut. I could sit down and eat them nonstop – of course I don’t. Are you coming to Fiesta Friday #51?